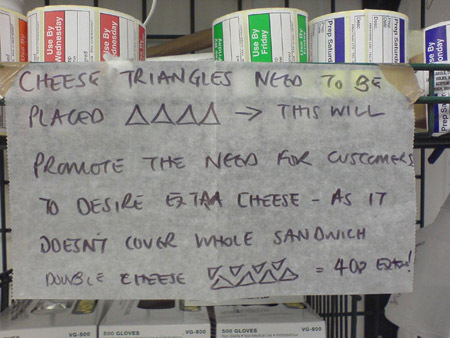 Fast Food News: Is This Subways Triangular Cheese Trick? And originally (when it was the 'patented U-guaug" shape instead of the new 'saw and fold open' method) the cheese hung off the sandwich slightly front and back, giving the appearance of a lot of cheese. Ok, I have officially thought about this too much! My family loves Subway, but I think they're not only stingy with the cheese, but also the meat. I've been buying the Veggie Delight and haven't noticed ANY difference in taste. Why pay an extra $2 for four microscopically thin slices of meat you can't taste anyway? I do get cheese (pepper jack) because you pay for it, whether you eat it or not. Subway, put some MEAT on your sandwiches! Ditto about not tasting the meat on Subway's sandwiches! I don't eat meat anymore and when I made the switch from the turkey sub to the veggie delight, I absolutely couldn't tell the difference. Same with chipotle actually - a burrito without meat tastes the same to me, plus you get free guac on a veggie burrito!